Cosmetic dentistry can enhance your smile by altering the color, shape, and position of your teeth. Stained, cracked or broken teeth can be restored to their original beauty. Crooked teeth can be straightened. Dark fillings, even missing teeth, can be replaced with restorations so lifelike, they are indistinguishable from your natural teeth. Whether you prefer a smile that is whiter-than-white or restorations that match your own teeth, cosmetic dentistry can provide you with the smile of your dreams. Please take some time to become familiar with the procedures used by Dr. Conness. Periodontal Therapy, to prevent and treat gum disease. A dental crown is a great way to repair a damaged tooth. A crown is designed to return a single tooth or a group of teeth to its proper form and function. This restoration is custom made and is either bonded or cemented in place. The crown protects the tooth from further damage. A crown can be made of numerous tooth-colored materials. Bonding is a procedure in which tooth-colored materials are applied to the enamel. Bonding covers discolorations, repairs chips, breaks and cracks and fills in gaps. It is a virtually painless procedure that can be completed in one visit. Periodically, it may have to be replaces since it usually lasts from three to five years. The bonding process involves etching a tooth surface with a solution that allows the bonding material to adhere. To match your own teeth, various color resins are carefully blended so the bonded tooth will look completely natural. After application, the resin is contoured into the proper shape and hardened using a special light or chemical process. It is then smoothed and polished to appear natural. Veneers are thin preshaped shells made of tooth-colored materials that are designed to cover the front side of teeth. They are fabricated by a dental technician from the impression provided by the dental office. Veneers are used to cover gaps or teeth that are stained, poorly shaped or slightly crooked. They may last from 3 to 12 years. Placing veneers is often an irreversible process because a small amount of enamel is usually removed to accommodate the thickness of the shell. Once teeth are veneered they must either be periodically re-veneered or crowned if a failure occurs or decay develops adjacent to the veneer. Whether you want to add an extra sparkle to your smile for that special occasion or simply perfect your look, whitening is simple, affordable, and safe. Nothing makes you look "WOW" like a white smile and nothing whitens teeth like deep bleaching. Deep bleaching works by revitalizing the tooth's ability to absorb oxygen. Oxygen is absorbed into the tooth and breaks down large dark stain molecules to small white particles. The results are amazing. Enamel shaping is a process of contouring natural teeth to improve their appearance. When teeth become slightly crowded or uneven, or eye teeth seem too long, enamel shaping may be used to correct the flaw. The process cannot solve all problems, however. Severely crowded teeth may need braces. Enamel shaping involves modifying teeth by removing or contouring enamel to create harmony and balance in the mouth. Enamel shaping, which is often combined with bonding, is usually quick and painless. No anesthesia is necessary when shaping the enamel and the results can be seen immediately. If missing teeth or gaps in your smile make it difficult to chew or leave you feeling awkward about your appearance, a dental bridge might be the best solution. Dental bridges are composed of natural-looking artificial teeth that fill the spaces left by missing teeth. Almost indistinguishable from natural teeth, the dental bridges used at our practice are composed of esthetic, tooth colored porcelain and attach to crowns or implants. These semi-permanent restorations can restore both a comfortable bite and a brilliant, full-toothed smile. Dental materials have come a long way in the last twenty years. We no longer have to fill cavities with silver fillings. These materials are tooth-colored resins, composites, and plastics that can provide a perfect color match to your tooth color. Instead of weakening teeth like silver fillings, these bonded fillings can help strengthen your teeth and hopefully give them a longer life span. Inlays and Onlays are used to repair teeth with large areas of decay. These restorations are custom made at a dental laboratory and are made of porcelain, composite, gold, or new hybrid composite materials. When a conventional filling would be too large, these restorations return teeth in question to their proper shape, form, and function. Sometimes more extensive dental treatment is necessary to return a smile to proper form, function, and esthetics. Maybe the patient has neglected themselves over the years or has had dental treatment performed by a collection of practitioners over the years using different materials or techniques. These treatments may now be breaking down or not functioning well with each other. Gum disease, recurrent decay, bite changes, and old worn out fillings may require more advanced rehabilitation. We carefully evaluate each patient's personal circumstances and clinical findings to develop a comprehensive treatment plan to give you a beautiful smile. We will be happy to discuss your dental needs with you. Dr. Conness can provide a wide range of oral surgery services for his patients. Some of these procedures include regular extractions, surgical extractions, wisdom teeth removal, and implant placement when indicated --all surgical procedures can be performed with anti-anxiety medication or IV sedation. Many surgical and nonsurgical periodontal treatments can be performed by Dr. Conness and his well-trained staff in one convenient location. Nonsurgical treatments such as deep cleanings, presurgical therapies, and ongoing periodontal maintenance are performed by our hygiene department. Many periodontal surgical procedures can be performed by Dr. Conness at both office locations. For patient comfort, these surgical procedures can be performed with anti-anxiety medications or IV sedation. Gum recession is sometimes treated by retrieving soft tissue from the roof (palate) of your mouth. However, removing a section of your palate creates unnecessary pain and discomfort. Click here for more information on "why to consider gum grafting". We offer a wide variety of removable partials and dentures for our patients. 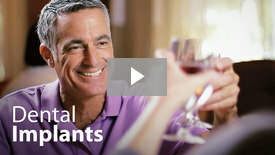 These removable appliances can be supported with natural teeth and/or dental implants.